Democratic legislators elected in a wave last fall found that getting a bill passed in the Virginia House of Delegates is no easy task. Nineteen new delegates — 15 Democrats and four Republicans — took seats in the House in January after the November election trimmed a 66-34 GOP majority to 51-49. That momentum, however, did not ensure that bills proposed by freshman Democrats would get a green light. In February, the Richmond Times-Dispatch reported that 27 of 202 bills filed by first-year Democrats were still alive at the crossover deadline, the point in the session at which the House and Senate finish work on their own legislation. Those stats translate into a success rate of about 13 percent. Of 1,610 bills filed by all 100 delegates, 589 — 36.6 percent — were passed by the House. Del. Danica Roem, D-Prince William, attracted national attention last fall by becoming the first transgender person elected to the General Assembly. That publicity, however, did not result in successful legislation. The Times-Dispatch said that all 11 of Roem’s bills died in a House committee or subcommittee during the session. Also, all 10 bills proposed by Del. Lee Carter, D-Manassas, failed to pass. Roem’s legislation included bills aimed at strengthening public records laws, protecting journalists from judicial subpoenas, developing a database of cold-case crimes and requiring health insurance companies to cover more prosthetic devices. Many of Carter’s bills concerned workers’ rights. 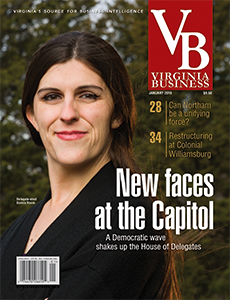 ]Virginia Business profiled Roem, Carter and the 17 other freshman legislators in its January cover story previewing the General Assembly.